We Are The World: Happy New Year!! As I write this, New Zealand and Australia have already welcomed in 2010. We on the east coast of the US, however, are still waiting patiently. In the rain. And in SC, it is a fairly warm rain. 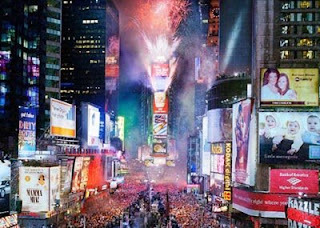 NYC began the New Years Eve tradition in 1907 with the first ball drop. The waiters and staff in many Times Square eateries and hotels were given battery powered top hats that lit up 1908 across each head with t-tiny lightbulbs. The ball has dropped every year since, except '42 and '43 during NYC's wartime "dimout." The crowd still gathered and bells were chimed, but no lights and no ball. The ball has undergone tons and tons of changes, different size/weight, different materials and colors and recently it has doubled in diameter and possibly tripled in weight, which is probably significant of our current lifestyles. The dropping of a ball to mark time seems to date back to maritime needs, a way to mark time for sea captains to set their chronometers. That's the type of thing that really attracts me to the "old days:" Traditions and Symbols for mass communication and community awareness. When I was a kid, for example, the whole neighborhood knew it was dinner time when Mrs. Gabello rang the big bell and all the Gabellos went running home. You could count on Mrs. Gabello's gong. Church bells are another great form of communication. In upstate NY, down the road from the Gabellos, our church bell would ring every Sunday morning and sometimes at odd times whenever, say, me or Matt would swing on the bell rope. In my town today, the Methodist church bells ring each day at noon. I love it and perk up like a dog, nodding my ear towards the north end of town. Lights. Lights are another great old form of communication. Combine church bells and lights and you probably think of Paul Revere's Midnight Ride. Two lanterns in the bell tower of Christ Church in Boston meant the troops should cross Charles River by sea instead of by land. (visit Boston if you haven't already, the history is so cool) Then of course there's lighthouses and stop lights, both for communication and order. SOS. Morse Code. That stuff is so cool. Flags - flags are used to communicate. I want a secret form of communication in Wagener, a new symbol that only residents and rural neighbors would know. I remember when the Claridge House Bed and Breakfast came to town, somewhere I read that they'd lay out a red carpet on the front steps which would indicate they are serving a public lunch. I thought that was so cool. I just knew I'd stop in for lunch when the red carpet was out. I watched and watched for that red carpet. Never saw it. I was so disappointed. Let's start a new symbol, give me some good ideas! to reinstate a new town symbol that would symbolize a call to action. Wow,New Zealand does it up right!! We,old folks,did it up right, we stayed up until way past 5:00 A.M. Concluded with breakfast,after looking for a place NOT crowded,at this hour!